When I was growing up, my mother used to eat food which I felt was pretty disgusting. The worse was just bread with raw green bell peppers with butter. The second worst was the same sandwich, but using tomato in place of the bell peppers. This sort of one-vegetable sandwich was bad not because of the veggies themselves, but rather because of the shallow flavor profile and the unpleasant textural combinations, especially when you pair cheap soft, gluey white bread with crunchy raw peppers and squishy butter. This new sandwich from 7-11 seems to be something after my mother's heart, but with a little more sophistication and depth. 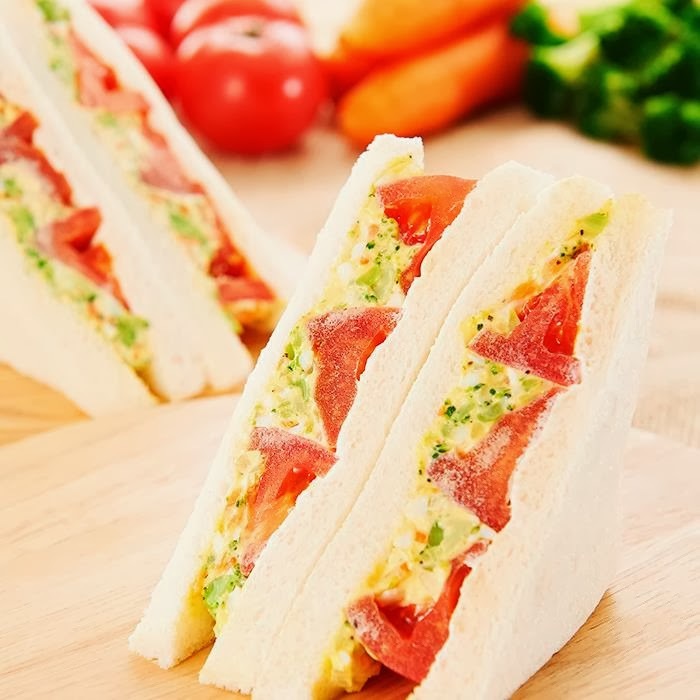 Those are biggish chunks of tomatoes glued into the sandwich with egg salad mixed with broccoli and carrot. A few reviews that I've read proncounce it "unusual" and "crunchy". I wouldn't exactly call those encouraging words. Blech! I had tomato and mayo sammies growing up. Hated them, I hated how stuck the food would get to the roof of my mouth and tiring my tongue trying to pry it loose without putting my hand in my mouth (BIG no no). Maybe it was poorness and lack of options. My sister was a fan of ketchup and lettuce sandwiches, equally gross to me. I like my sammies with the works with a robust bread that isn't the consistency of soggy toilet paper.